Consumers accustomed to communicating, shopping, banking and booking travel online increasingly expect those same conveniences from their healthcare providers. And as Lehigh Valley Health Network (LVHN) has learned, despite the myriad of benefits a patient portal offers, the most important reason to incorporate this interactive tool into a physician practice is because patients want it. 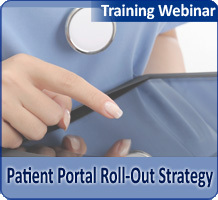 Dr. Sheinberg and Lindsay Altimare, director of operations for Lehigh Valley Physician Group at LVHN, walked through the rollout of the LVHN portal to its ambulatory care providers during Patient Portal Roll-Out Strategy: Activating and Engaging Patients in Self-Care and Population Health, a November 2017 webinar now available for rebroadcast. The 2015 launch of LVHN’s patient portal and its continued user growth has earned it the distinction of being the fastest growing patient portal on the Epic® platform. 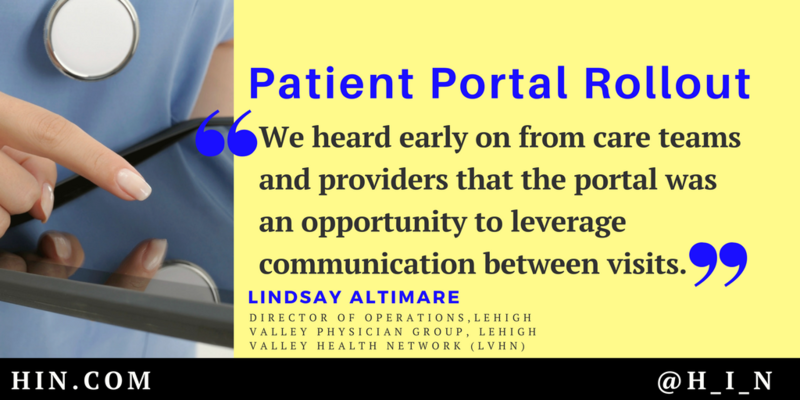 As Ms. Altimare explained, LVHN first launched its portal with limited functionality in February 2015 as part of the Epic electronic health record that had gone live two years earlier. But even given the portal’s limited feature set, LVHN quickly recognized the tool’s potential to enhance efficiency, education, communication and revenue outside of traditional doctor’s office visits. At its providers’ request, however, LVHN first piloted the portal within 14 of its 160+ physician practices, using feedback from providers in the two-month trial to further tweak the portal before next rolling it out to its remaining clinicians, and finally to patients. LVHN supported each rollout phase with targeted marketing and education materials. Today, LVHN patients and staff embrace the functionality of the portal, which offers an experience similar to that of an online airline check-in. Via the portal, LVHN patients can self-schedule appointments, complete medical questionnaires and forms, even participate in select e-visits with physicians—all in the comfort and privacy of their own homes. Not only are about 45 percent of LVHN’s 420,000 patients enrolled in the portal, but self-scheduling doubled in the first six months of use. Additionally, upon examining a segment of portal participants over 12 months, LVHN identified a steady rise in portal utilization for common tasks like medication renewals and medical history completion. The portal “liberates our patients from the need to access our providers in the traditional way,” says Dr. Sheinberg. Appreciation of this freedom is reflected in improved patient experience scores, he adds. This entry was posted on Thursday, November 30th, 2017 at 12:36 pm	and is filed under Accountable Care Organizations, Care Coordination, Digital Health, Electronic Health Records, Electronic Medical Record, Health IT, Patient Engagement, Patient Satisfaction, Physician Practices, Population Health Management, Telehealth & Telemedicine, Value-Based Reimbursement. You can follow any responses to this entry through the RSS 2.0 feed. Both comments and pings are currently closed.